When we bought the camper van,we always imagined that we would be able to use it to get back to hill walking. We used to do a lot of hill walking before our twins arrived but, understandably, when they were babies, it became too much of a logistical nightmare. As the kids got older, we imagined using the van as a great support vehicle. We would either get to the hills early and have breakfast when we arrived or have dinner before setting off home and, either way, miss the traffic. Our attempts at getting our twins to enjoy hill walking have so far been futile. We have endured walks listening to “how much further?” and “my legs are killing me!” Not my idea of fun. 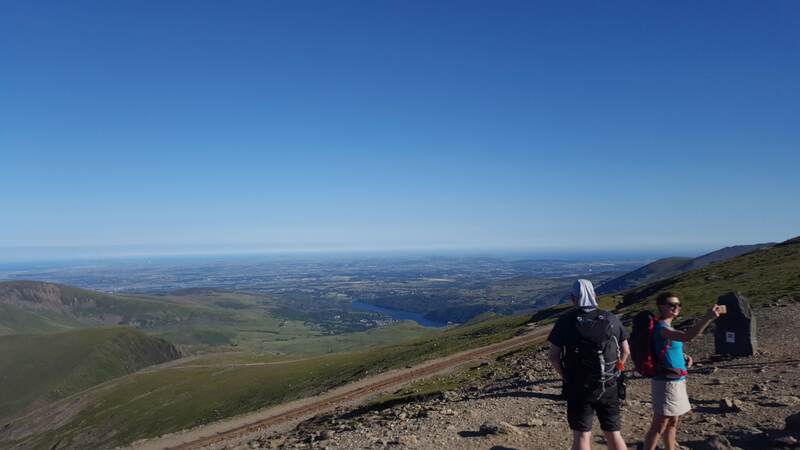 Last weekend, we had a convergence of various factors that led to the perfect opportunity to climb Snowdon. Although I’ve climbed Snowdon 4 times before, I’ve always fancied doing it really early in the morning when it wouldn’t be too crowded. Friends told us that they had stayed in the car park at Pen-y-Pass the night before and then got up early to beat the crowds. The twins were at Scout camp, the van wasn’t out on hire and the weather was perfect. We had discussions about whether to take our Border Terrier but he’s 15 years old now and wouldn’t have managed it, even if it hadn’t been hot. So our neighbour agreed to have him for the night. The scene was set. 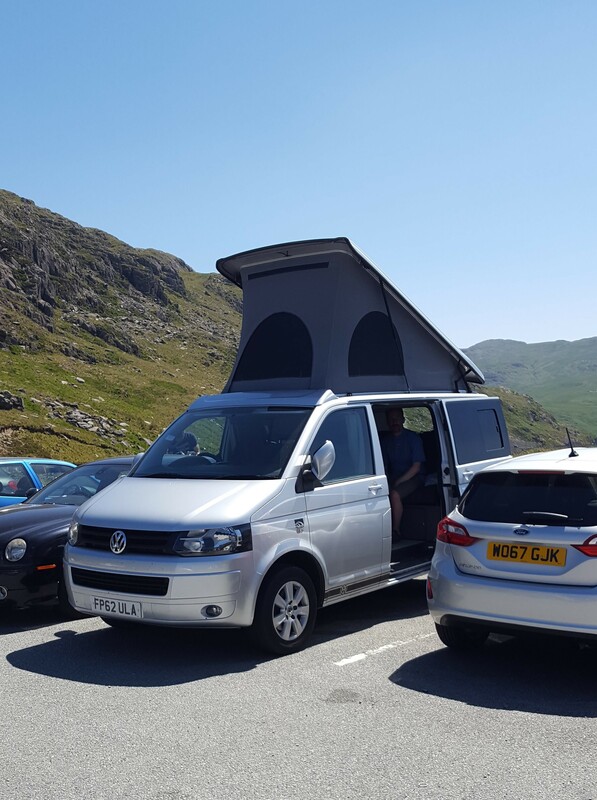 When we arrived at the Pen-y-pass car park at 10.15pm on Friday night, it was still pretty busy and we thought we weren’t going to get a space. Luckily we found a spot near another VW camper whose occupants had the same idea as us. We found that it was £10 to park overnight and another £10 to park during the day. As we had access to toilets and a well kept car park, we were happy to pay the charges. It is not too different to a decent campsite in our view. 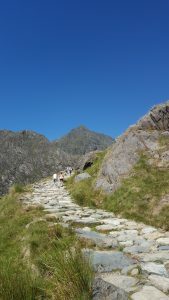 The fees are also used for the upkeep of the paths on Snowdon. This is peak (no pun intended!) time for the Three Peaks Challenges (climbing Ben Nevis in Scotland, Scafell Pike in England and Snowdon in Wales). The car park was full of people in minibuses either celebrating the finish or dragging themselves up the mountain! We didn’t really get a lot of sleep as there was a lot of coming and going. Finally at 4.45am, we decided to get up. 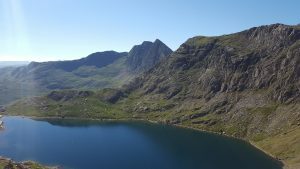 A slowish breakfast followed and then we started on the Pyg track at 6am. It was reasonably cool as we were still in the shade but as we were climbing, we soon warmed up. With the weather forecast still to be HOT, we broke our usual rule of taking a fleece for the summit. Waterproofs were definitely not needed. We reached the summit around 8.30am to find the trig point completely crowded with people! Not quite what we had intended. 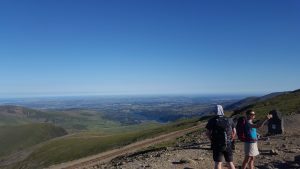 There was a group who had just finished the Three Peaks Challenge so I helped them out by taking some photos for them. They were raising money for Great Ormond Street Hospital and said it was one of the toughest things they had ever done. The cafe at the top wasn’t due to open until 10am so we ate our own provisions, on the steps near it, sheltering from the wind (we would have benefited from our fleeces after all!) and then made our way back down. We decided to branch off and come back down the Miner’s Track. This was initially a very steep descent but, once at the bottom of this, we were then able to stride out as this is more of a gradual path. There were a lot more people by this stage and, as the temperature was rising rapidly, most of them were really hot. The few dogs we saw on the mountain were happy to cool off in the lakes/llyns on the route. We were glad that we had gone up earlier despite the lack of sleep. 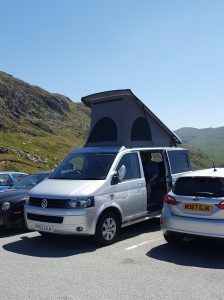 We got back to the van at 11.20am for a quick change out of sweaty clothes and headed off for lunch at Moel Siabod Cafe in Capel Curig. The Audi who drove up just as we were leaving could hardly believe his luck in taking our space. The car park at Pen-y-Pass is really busy.  From reading contributions on a forum, you really need to be there by 7am in peak season, maybe later in the autumn and winter. It was already full when we got up that morning though! Or go the night before and stay over as we did. If it is full or you’re not keen to pay the £10 charge, there is a free park and ride in Llanberis. The car park gives you access to 2 of the classic paths on Snowdon: Pyg and Miner’s Track. The other most used path is the Llanberis path. It is said to be easiest but longest way up Snowdon. I opted not to wear my hiking boots and just wore my “outdoor trainers” because it was such a nice day. I’d wear my hiking boots on all future trips as I went over on my ankle a couple of times. We also threw caution to the wind and didn’t take a fleece for the summit. Even on a day in the middle of the recent heatwave, it was windy and cool at the top so always take an extra layer! 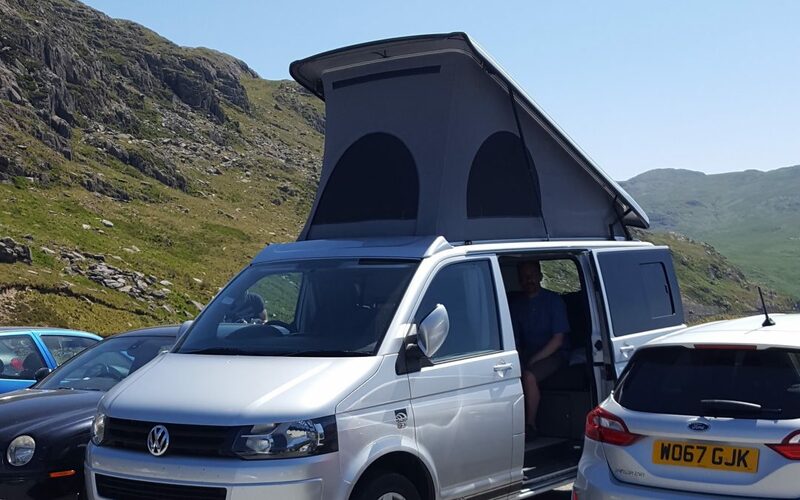 Get in touch with us for hiring our van, whether that is climbing Snowdon or even as a support vehicle for the Three Peaks Challenge. With our unlimited mileage policy, it is perfect for your next adventure.